I have been busily scattered and the health finally seems on the improve. Lots of interesting and quirky things about. Saw this poem I Write in the Laundromat over at Homepaddock blog and liked it very much. It sort of ties in to an article I have been analysing for my studies – The Per/son Authorised: Married Women’s Autobiography and the Death of the Author, 1882 & 1992 by Tracey Slaughter around the Edmond family auto/biographies, which has been deeply challenging. I also spotted this book about Maori Architecture on Beatties Book Blog which looks excellent. I was initially attracted by the cover photo of one of my favourite buildings. Peter Peryer is blogging more regularly again which is great. I liked today’s rose photo – although personally I prefer Bantry Bay. Have been having some great and some very inane conversations over at twitter with myself and other people (follow me @artandmylife). Great place for working out ideas. Don’t expect high level stuff from me though. 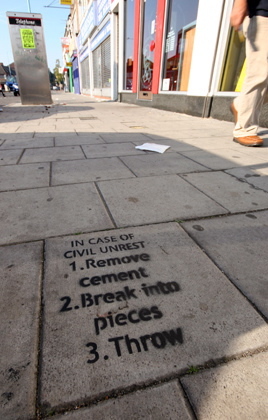 Am trying to think outside the box for employment options at the moment. Haven’t got very far though. Finally, here is a photo I took in an alley near the Art Gallery. Art cakes – so if using all my domestic skills, I made a cake reproduction of say “Victory Over Death II” – would that be a copyright infringement? Cass, of course, has been done. Oh and super-congratulations to Helen H on being accepted into Hogwarts. We must have bubbles soon. Well its a year since I started this blog. A year with some pretty big ups, downs and change arounds for me but I managed to keep going here – which amazes me. Blogging has opened doors and introduced some wonderful people into my life which has been all good. I feel I should list people but you know who you are….It’s also opened my eyes to many new ideas while letting me have a forum to explore them. This blog is meant to be about art and my life and so is a very personal view. That has been problematic at times because I am always learning. The biggest education experience for me this year was a tour of “Reboot” at the City Gallery, Wellington with a talk by collector Jim Barr. I think I get it now – I don’t necessarily like it all, but I see. I feel a bit guilty about not searching out more challenging art since then, but access to formal art remains a bit of an issue. I’ve had a busy day today and not really on the lookout for ART, but at my daughters ballet exam this morning my eyes wandered again to a graphic of Martha Graham * that hangs on the studio wall. Of course dance is an art itself but this picture seems to capture the freedom Graham embodied. I couldn’t find an exact copy online but Warhol does an ok job of dance art – and its taken from an excellent 1940 photo by Barbara Morgan. It doesn’t quite capture the same spirit though as the poster in the studio (whoever that is). I try to honour a tradition of “a year and a day” to decide about committing myself to things, so I guess I have another day to decide about the future of this blog. Whatever – its been fun. I have had no cause until now to talk about the US Presidential elections. I find it it a bit sick-making and since Palin entered the fray – quite frightening. Anyhow I read this today and it made more sense to me than most things I’ve read on the topic so far. So would Obama or McCain be immortalised by Warhol? 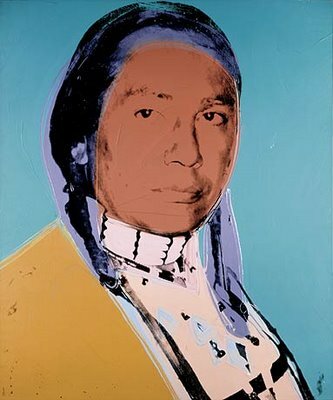 Obama maybe, but the suggestion of Russell Means for President or even the Republic of Lakota brings hope. So Mr Obama – a Native Amercian President really would be change. The days are much shorter here now and the weather a little cooler. Today there is pot of ham and lentil soup in the making and rugby on the go. We have been having a lot of ‘comfort food’ lately which while curled up with a blanket by the fire (what a nana) made me think of ‘comfort art’. While I doubt any artist wants to be identified as the bread and butter pudding of the art world, in my life I often retreat to what is familiar, warming and a little nostalgic. For the most part, I like to be challenged and provoked and made to think by art, but some days its all too much and I fall back on old favourites. I don’t think these are generic artworks and my favourites would be rather different than someone else’s choices and in fact might be the opposite of comforting for another. I think this feeling is possibly why painting continues on even though every one keeps saying its dead. Perhaps what I have nostalgia for will be seen in 30 or 50 years time in the same light as the Constable print of “The Haywain” my Grandmother had on her wall. 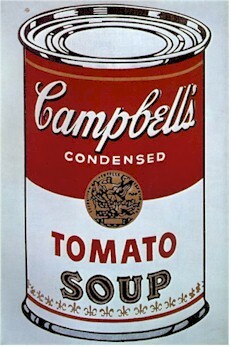 Andy Warhol Campbell’s Soup Can – Comfort Food/Art? I have almost accidentally accumulated a small collection of dramatised movies about artists. While some are not so great, Frida, Basquiat and Pollock are excellent. Here is a very short list – please comment if you have any others to add (reviews would excellent too). Documentaries too if you want. BTW – what’s happened to Artbash?? ?